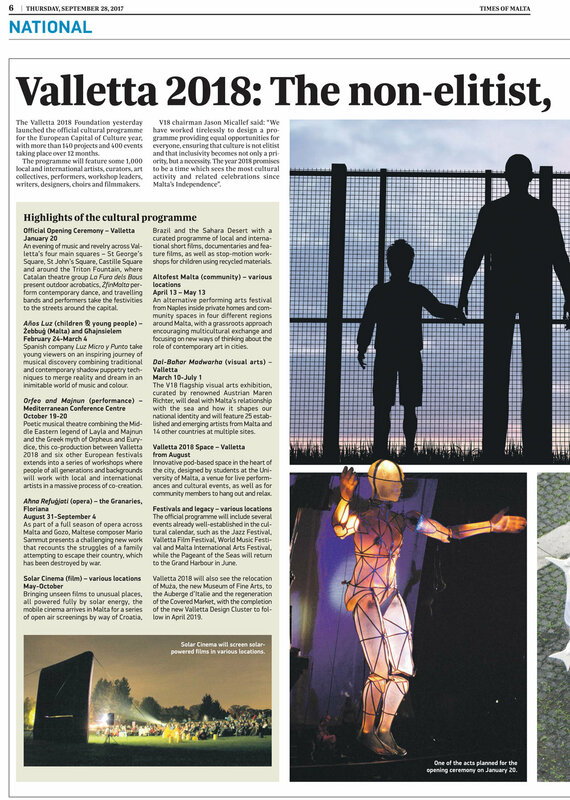 We are very proud to present that Solar Cinema will be part of the Cultural Programme of Valletta 2018, European Cultural Capital. We will tour the islands of Malta and Gozo with weekly screenings on the most beautiful locations. Bringing film close to the audiences. On village squares, beaches and piazza's everybody is welcomed to come and enjoy our film screenings. We will organise a kick-off event during the Green Festival, with stopmotion animation workshops for children and our Go Greener Shorts Filmprogramme screened on a big square in the city of Valletta! Keep checking our facebook and our Malta 2018 webpage for all updates and programme information. We are very happy to announce our latest sponsor! GreenTrust Consultancy is a specialist in wind energy projects in The Netherlands and abroad. Their motto is Changing Energy. Green Trust is working on the transition from conventional to renewable energy. After presenting the work of Solar World Cinema at their yearly ‘GreenTrust and Friends’ day, where specialists in the green energy business gathered to talk about their work and were inspired by several ‘green’ projects, we were happy to hear that GreenTrust wanted to sponsor us. 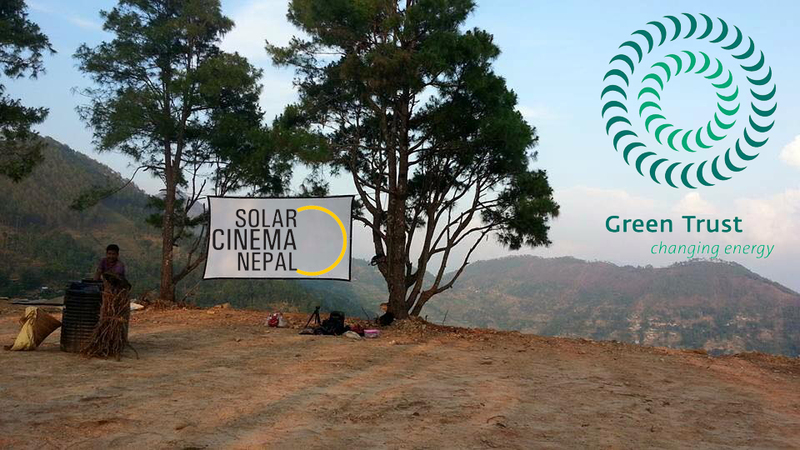 With their donation we have been able to support our partner project: Solar Cinema Nepal. The very dedicated projectleader Abhimanyu Humagain is running this small local solar powered cinema, reaching out to the most remote areas of Nepal. Sometimes moving all of his equipment by foot, tractor of donkey! His set up needs a boost and with the help of the sponsorship of Greentrust a investment in new equipment can be made! This enables Solar Cinema Nepal to keep up their fantastic work. For the past thirteen years, the Western Sahara International Film Festival (FiSahara) has been screening movies annually for thousands of Sahrawi refugees who live in a remote corner of the Sahara Desert, near the Algerian town of Tindouf -- a place where films are rarely seen. But after this edition on October 11-16, refugees will no longer have to wait an entire year to congregate in front of movie screens: FiSahara and Solar World Cinema have partnered to create Solar Cinema Western Sahara, that will tour the camps year-round, making film much more available to camp residents. Solar Cinema Western Sahara will launch on FiSahara's opening night, October 12th in the Dakhla refugee camp, with the screening of the documentary film Sonita by Iranian filmmaker Rokhsareh Ghaem Maghami, an extraordinary story of courage and audacity featuring a young teenage girl, Sonita Alizadeh, who as an undocumented Afghan in Iran struggles against the odds to avoid child marriage and realize her dream of becoming a rap star. Ghaem Maghami will be at FiSahara to present. Sonita is one of the films that will travel with the Solar Cinema Western Sahara to all Saharawi refugee camps in the area during this coming year. The project will be managed by a local Sahrawi team. The Sahrawi mobile cinema will use a converted Landcruiser fitted with solar panels, batteries and screening equipment that recently travelled from the Netherlands to the camps as part of a humanitarian convoy. Sahrawis in the camps are the refugees of the four-decade conflict in Western Sahara, which remains one of the world’s most invisible crises. The Western Sahara, a former Spanish colony rich in natural resources, stretches along the coast of the Atlantic Ocean between Morocco and Mauritania. Spain reached an agreement with Morocco and Mauritania as it was withdrawing, allowing them to invade. Half of the indigenous population fled the brutal invasion into the Algerian desert and settled in refugee camps, where they remain today. The other half still lives under Moroccan occupation -- Mauritania withdrew in 1979 -- separated from family members by a 2.600 kilometer-long Moroco-built wall sewn with millions of landmines. The UN Security Council, which called for a referendum on self-determination 25 years ago, is currently deadlocked on a solution. Access to basic services such as drinking water, electricity and food is scarce in the refugee camps, and its residents are entirely dependent on foreign humanitarian aid. The population has very little access to culture, leisure and entertainment and suffers from extreme social and geographic isolation. Children and youth are especially vulnerable to depression as they view their future devoid of opportunity and hope. Film is a powerful tool for social change, and for Sahrawis it offers a respite from the harshness of everyday life, as well as a window to the world and a medium to preserve their rich cultural identity -- which is key to their survival as a people. FiSahara's film school, EFA Abidin Kaid Saleh, trains dozens of Sahrawi filmmakers, who are giving birth to a brand-new indigenous Sahrawi cinematography. Through the screenings of these locally made films, Solar Cinema preserves and showcases Sahrawi identity. In addition, Solar Cinema Western Sahara will also screen a variety of films, including independent international cinema, human rights and entertainment movies, some from FiSahara's program. Sahrawis will be able to exchange locally made films with other Solar Cinema projects, providing a rich tapestry of stories from around the world. Local managers will receive technical training to operate the cinema, as well as to organize and moderate panel discussions. This year, as FiSahara's screens in Dakhla go dark at the close of the festival, they will light up again and again all year round powered by the only natural resource available to the refugees: sunlight! The end of July we will, in collaboration with our local team, launch Solar Cinema Indonesia. Our mobile cinema on solar energy. We would love to start right away with our sustainable film workshops, however we need iPads in order to complete our stop-motion studios. Our education program makes use of specially designed studios with a build-in Ipad. We could really use some second hand iPads to start the workshops. In the workshops, short stop-motion films are made that afterwards are presented on the screen. We believe that workshops combined with the film screenings have an even bigger impact on communities. Children or youngsters participating in the workshops invite their families and friends to the film screenings and spread their freshly acquired knowledge. With your help we can accomplish these goals. If you have a second hand iPad you would like to donate, please email us. Thank you so much in advance! We are delighted to have started a collaboration with new partners in Croatia. The team of Via Solis visited the Netherlands for a brief set-up training. Technical knowledge was exchanged. The croatian team collected all the necessary solar equipment and set off back to Zagreb. In spring the Solar Cinema Adria will have it's launch and will start touring the country. The project Screen on the Green will now be totally 'green' with the use of solar energy! A special thanks to our partners Victron Energy and LG Solar the solar division of LG Electronics. UvA Alumnus Award for Sahara project! 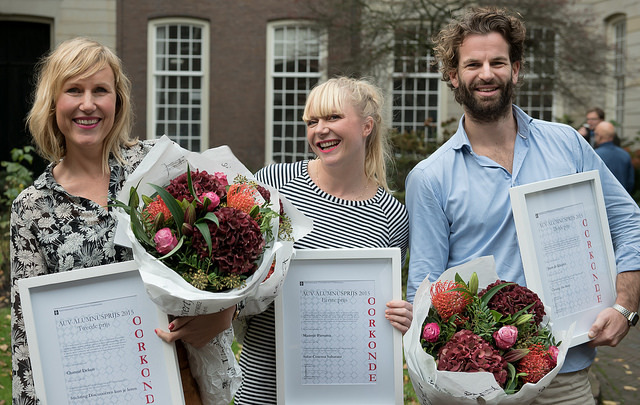 Last Saturday Maartje Piersma won the UvA Alumnus Award for our project in the South-Western Sahara. "The UvA Alumnus award is an incentive for UvA alumni who, via an appealing and innovative project, make a special contribution to society. The winner is an inspiration to others and serves as a promise for the future." After visiting the South-Western Sahara last May, we are currently setting upa local Solar Cinema in collaboration with FiSahara film festival and the TheAbidin Kaid Saleh audiovisual school. The Western Sahara’s almost four-decade conflict is one of the world’s most invisible crises. Exactly 40 years ago Morocco and Mauritania occupied the Western Sahara when Spain, the former colonial power, reached an agreement allowing the invasion to go forward. Thousands of Sahrawis, including many women and children, fled from the repression that followed and crossed into Algeria, where they were allowed to settle near the town of Tindouf. Access to basic services such as drinking water, electricity and food is scarce. Basic life in this remote, isolated corner of the desert cannot be sustained in this environment, and the camps are completely dependent on foreign humanitarian aid. The population has very little access to culture, leisure and entertainment and suffers from extreme social and geographic isolation. We are planning to launch Sahrawi Solar Cinema in May 2016. The Alumnus Award is a great contribution to this goal! We participated in the Hague Talks, a meeting place for creative minds, peace inventors and game changers in the field of peace and justice. It is a stage and breeding place for new ideas and perspectives, a forum for discussion and a starting point for concrete action. Sharing our mission and story.